this post brought to you from the scary yet brilliant mind of Sam I am. AKA my 21 year old daughter in College with a major in psychology. If you want to read my more about my daughter Sam I am she's spattered all over my other blog. 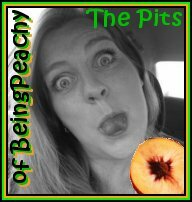 www.BeingPeachy.com including her infamous FLAME about dirty ATM's and Safe words. Your daughter is smart. A honey baked ham. Don't pannico. I'm sure she'll turn out just fine. I totally would but between 20 credit hours of her 4th year at the university and working full time to pay for it, she simply rolls her eyes at my blog deadlines and the very fact I do it. I would LOVE LOVE LOVE to have a Sam day once a month. Greatest freakin' post EVER!!! haha... I'd drink a beer with her. My first born oughta hook up with your little PeachPit for a night of revelry... my daughter writes and is even less inhibited, if that's possible. We'd probably have to notify the authorities to make certain there weren't any crowd control issues. I second the motion for a Sammy Day on your blog, or better yet, encourage her to start her own and we'll all just switch back and forth between the two of you. You've got a great, amusing daughter there. I like the photo too. GAH!!! I love your Sam!!! Positively brilliant! 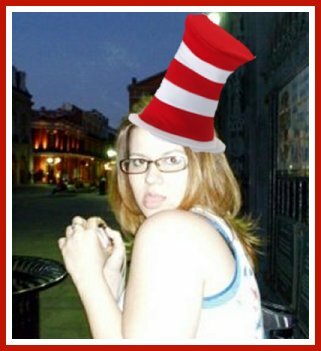 I love, love love her updated version of Green Eggs and Ham. I'd read this post in a box, with a fox, in a house with a mouse. I would laugh at Sam I am's poetry here or there or anywhere. i love excess, excessively!!!! way to go sam i am. Just remember: she was almost my kid first. I'm totally reeling that you chose Blogger. It's like we aren't even illegal immigrants together anymore. BTW, the word verification for me was "SHITmenu"
Yes almost near father of my first born who is changing her name to Lord Samantha. Under Ruler of Mayhewba. 1 - you aren't even an illegal immigrant. 3- I hate word verification because I feel like people are testing me and it makes me testis, I would turn it off but I don't know how. Her witty prose won her the LOL award on my Page!! !